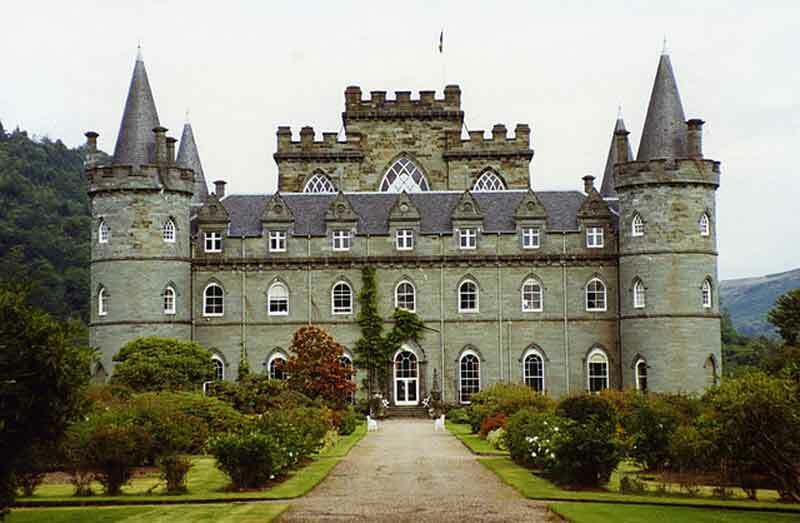 Inveraray Castle has been home to Clan Campbell since the early 1400s, come the 1640s, ardent Covenanter Archibald Campbell, Clan Chief and the Marquess of Argyll found himself caught in the chaos of civil war raging throughout Britain. In 1644, Inveraray and its castle were ransacked and burned by the army of James Graham, the First Marquess of Montrose. The attack saw Argyll fleeing from his burning castle in a rowing boat down Loch Fyne. Whilst he escaped, 800 men, women and children were slaughtered in the streets of Inveraray, those who survived were left to fend for themselves in the notoriously harsh Scottish winter. Also left behind was the Marquess of Argyll’s harp player, the Harper was soon found by Montrose’s soldiers and hanged. Later, both the Marquesses of Montrose and Argyll were executed and plans were drawn up to build the third Inveraray Castle in 1720, which was finished in 1789. The Harper’s music at one time could be heard coming from the Blue Room, when no harps were present in the castle. But he is said to mainly haunt the castle’s Green Library, for over a hundred years there have been strange noises, one in particular is as if a pile of books have fallen over, on investigation; nothing seems to have been disturbed and nothing can account for the noise. Usually only the family members can hear it, guests very rarely hear it if present at the same time. Women are a particular favourite of the Harper – the Duchesses of Argyll have seen him more than the Dukes. He is believed to be a friendly ghost, who likes to make his presence known in mischievous ways, he is known to throw books around and cause some people visiting the library to inexplicably burst into hysterical laughter. Reminiscent of the ghostly galleon that sails up to the castle when a Duke of Argyll dies, the Harper also becomes more active. Female visitors most often see the Harper’s apparition around the time of a Duke’s death and the subsequent funeral. The Harper was especially feisty in October 1922 on the death of Lord Breadalbane, an important member of Clan Campbell. The 10th Duke felt ill the night before the funeral, and took to his bed, deciding he would be unable to go to the funeral. The Duke’s sister, Lady Elspeth, and Ian Douglas Campbell, who succeeded as the 11th Duke were sitting in the library, suddenly they heard a tremendous racket, like the sounds of books being thrown coming from the turret room attached to the library. The door then opened by itself, and a shape shuffled into the library. They rushed to inform the Duke of what had happened, he said it was perhaps the Harper responding to the death of Lord Breadalbane, the Duke believed that the Harper was probably angry at him for deciding not to attend the funeral. In 1949, the 10th Duke of Argyll, Niall Diarmuid Campbell lay dying at Inverary Castle, the doctor and local minister at his side. Suddenly they heard the sound of heavenly harp music coming down the hallway, they went to investigate and saw no one playing a harp. On their return to the bedroom the 10th Duke had passed away. Arnish Moor on the Isle of Lewis has long been haunted by tales of murder and mystery. MJ STEEL COLLINS reports.